Designer Con 2013 Trip | tessa.yvonne.morrison. Posted on November 30, 2013 by tessa.morrison. Wednesday, November 6th, I made the 19 hour drive from Austin to Pasadena with the gals from Ink It Labs to work at their booth at Designer Con. For the uninitiated, Designer Con is an annual design convention with over 800 booths selling designer toys, art, stuffed animals, jewelry, clothes, shoes, faux taxidermy, etc. Ink It Labs creates laser cut and print wood and acrylic charms, jewelry, and toys. This year Ink It Labs collaborated with several artists and created limited edition pieces we sold at our booth. Designer Con 2013 was an amazing experience where I got to meet great artists such as Gary Ham, Amanda Spayd, Chris Ryniak, Jason Limon, Scott Tolleson, Michelle Romo, and Paul Frank (who we did not recognize)! It was soo overwhelming with all the different vendors and what felt like too short of shopping time available to me since I was there working. I made a bunch of new friends and work contacts and one new client of Ink It Labs made my year. When he found out I created fiber art and puppets he informed me that he was friends with Sid Krofft and invited me to hang out with him at Sid Krofft’s house! The creative mind behind H.R. Pufnstuf and Land of the Lost. Words cannot express how awesome his house was, ok well, maybe; Dwell magazine would have peed their pants. He had a tree house, koi pond, hearth that would have looked right at home in the Shire, a water tower on the house feeding clean water into the pool, a studio where he hosted artist residencies, an African Grey parrot named Harley who gave him kisses, and a giant fluffy orange persian cat named Mr. Red. There were plants everywhere, it looked like the set from Land of the Lost, and under the stairs there was a spherical fish bowl. I didn’t get pictures of the inside of his house, but you can watch the movie Ruby Sparks; his house was used in a scene. Lauren and I with Rick and Deb Lazzarini of The Character Shop. 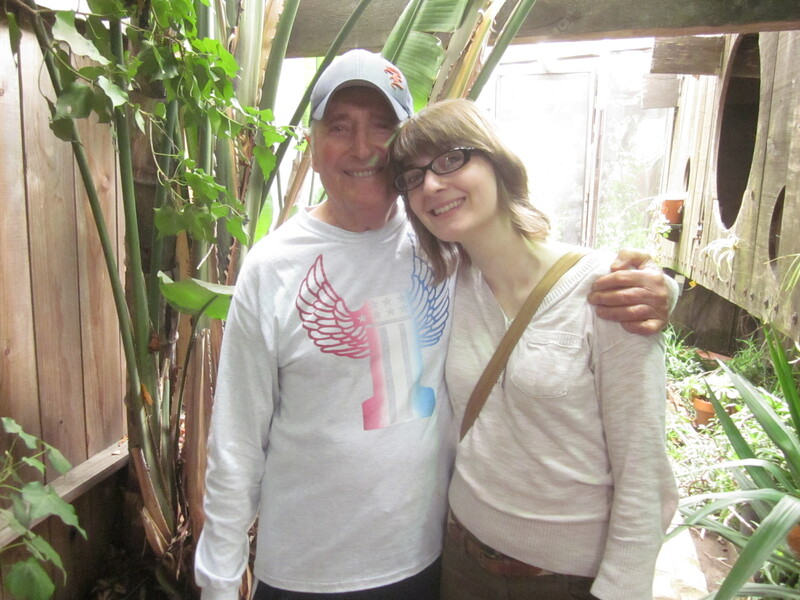 Still reeling from the whole experience of meeting Sid Krofft at his house, I got an email from Rick Lazzarini asking if I could work with him on a project. I’m bad with names, however I kinda recognized the name, but I definitely recognized the company name; The Character Shop. 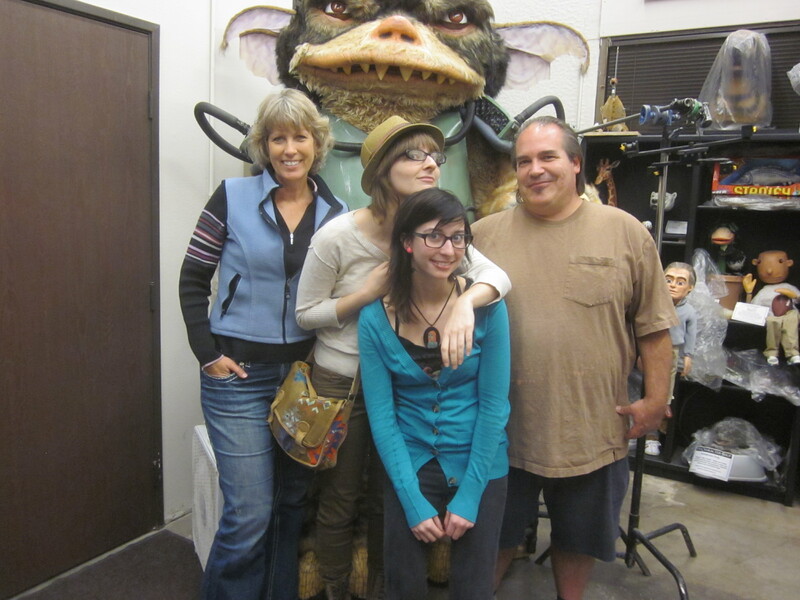 They are a special effects studio specializing in animatronic puppets! I had not met Rick at Designer Con, he just happened upon my work online. I call him and we get invited for a tour of his studio. Rick created the Queen Alien in ALIENS, he worked on Hocus Pocus, The Sandlot, Mimic, etc. I used to watch the T.V. show Movie Magic, LOVED IT, well they were on an episode and that is where I knew them from. The Character Shop was insane, I was like a kid in a candy shop, marionettes, hand and rod puppets, maquettes, animatronics, and they were nice enough to show us around and even let me operate an animatronic tentacle! squee*! The day after our visit to the Grand Canyon we went to Albuquerque and hit up The Stranger Factory and Walter White’s house from Breaking Bad. The lady who lived there was home and told us stories about her home being picked as the location and being on the set of the show. Those were our last stops before getting home to Austin on Friday, November 15th. This entry was posted in Uncategorized and tagged Amanda Spayd, animatronics, Chris Ryniak, Crowded Teeth, Designer Con, Designer Con 2013, Gary Ham, Ink It Labs, Jason Limon, laser cut acrylic, laser cut wood, lasers, Lauren Hemphill, puppets, Rick Lazzarini, Sid Krofft, Tara McPherson, Tessa Morrison by tessa.morrison.. Bookmark the permalink.